We’ve had a love-hate relationship for more than two decades now, and I think now is the time to permanently end the relationship. I fell in love with scrapbooking the day I flipped through one of my friend’s scrapbook. As I turned the pages, I thought, “I really want to do this. 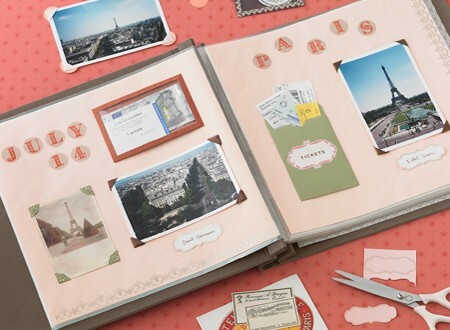 This looks like so much fun!” That moment sparked my love for scrapbooking and craft stores. However, technology has advanced tremendously, completely simplifying my scrapbook needs. I can spend hours on my laptop arranging and rearranging pictures and picking and choosing different themes with just a click of the mouse. I no longer need to haul out all of my scrapbook supplies and spread it all over the living room for Charlie to sidestep and my cats to nap on. The digital method isn’t perfect. I can’t add cute little stickers or other embellishments to the pages. I’m unable to layer multiple pretty papers. And at first, the final cost of digital printing seems expensive even with online discounts. While paper scrapbooking may be a teeny bit cheaper, the supplies, tools, photo prints, and scrapbooks aren’t free and the cost can add up quickly. Ultimately, having almost everything I need at my fingertips was the biggest advantage for me. 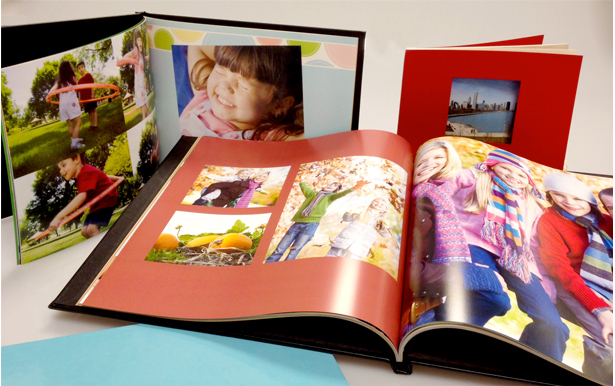 Anywhere I take my laptop, I can create and edit various scrapbook projects – provided I have Internet access. I really really really like the idea of not having a physical scrapbook inventory. I buy cute stickers one day, misplace them in the next second, and find them a year later. I buy super cute scrapbook paper on clearance but rediscover it two years later in a forgotten bin. I buy adorable scrapbooks on clearance, but they continue to sit on a bookshelf year after year, collecting dust. I’ve misplaced my paper trimmer countless of times. I’ve organized and reorganized my scrapbook supplies numerous occasions. I have craft scissors I still need to return to my mom. Yes, I know we parted ways almost 10 years ago. In my defense, I rarely worked on scrapbooks because other hobbies nabbed my attention. I foolishly thought I was over scrapbooking and donated my stash of scrapbooking supplies. A few years later, I missed trimming, cutting, organizing, and decorating a page with pictures, quotes, ribbon, and stickers. One day, I will no longer store scrapbooking supplies, but for now, I need to keep them for a bit longer for one big and final scrapbook project. I used normal binders when I first started scrapbooking, but now, I would like to transfer those pages into 12×12 scrapbooks, which I started use when craft stores lowered the price and offered a prettier and wider selection. I have no intention of redoing or redesigning the early pages – I’m not that ambitious or stupid. I just plan to take the decorated letter-size page and stick it to a matching 12×12 paper. Easy peasy. Maybe. Hopefully, this final project will downsize my scrapbooking stash: the dusty scrapbooks, the collection of paper, and other supplies. If I’m ambitious, maybe I’ll start the project this year. Maybe. I am a little sad about parting ways, because I’ve always loved scrapbooking and working with various tools, papers, and embellishments to make one page look super pretty. Scrapbooking makes my heart happy. Online scrapbooking reminds me of designing pages at the newspaper. Kind of the same thing but without deadlines or breaking news ruining a layout. Thank you for the memories, paper scrapbooking. Thank you for creating a mess and forcing me to clean it up or just leaving some supplies and papers on the kitchen table. I will miss it in some ways, but the convenience of going digital really speaks to my heart right now. This isn’t the final goodbye because we have one final project to complete. But thanks for the memories.